There’s nothing quite like unwinding after a long day in your very own backyard (or indoor!) hot tub. But with great comfort comes great responsibility—hot tubs typically require a whole lot of TLC. But no worries. Keeping your hot tub in great condition is easy with these maintenance tips. Use the info below to enjoy your hot tub for years to come. Check the cover of your hot tub for a couple things. First, make sure no water has piled up on top of it. This could cause the growth of mold over time, and damage the hot tub itself. Second, you’ll want to make sure that the cover is actually protecting your hot tub. It should fit snugly, and not expose any of the water to the outside air. Check up on the water temperature. Make sure the temperature has not changed drastically, as that could signal another issue with the hot tub. It should be that perfect balance of not too hot, not too cold...just right. Clear any debris that may have fallen on your hot tub. 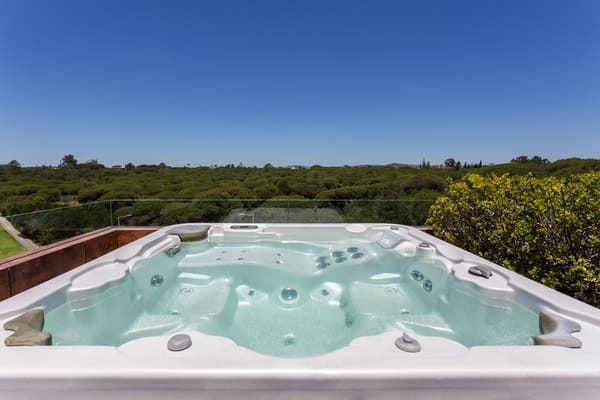 Maybe there was a big storm, or maybe the nearby trees have left your hot tub with an unwanted layer of fallen leaves—whatever the case, make sure the surface is clear and clean. Review those sanitizer levels! This will make sure the water is clean and that your hot tub is ready to be used at any time. Check the pH level. This one is really important. When the chemicals in the water are balanced, your hot tub is safe to use. Stock up on pH-level test strips to get the job done accurately, quickly and effectively! Clean the spa filter. You don’t have to do this one every week, but it is still good to keep top-of-mind. Every three weeks or so, clean your spa filter to keep things in your hot tub running smoothly. Keep it polished. Every month, do a few surface-level maintenance checks to keep your hot tub looking fresh. First, condition the cover of your hot tub to increase its lifespan. While you’re at it, clean the cabinet to keep up appearances. Drain and refill. Every few months, completely empty out your hot tub and scrub it from the inside out. A vigorous deep cleaning will ensure that your hot tub is in tip-top shape and help you enjoy it for years and years to come. When you are done cleaning, refill your hot tub with fresh water and repeat the process again as necessary. Mosby, Carolyn. (2014, April 7). Beginner’s Guide to Spa & Hot Tub Care. Swim University. (2015, March 12). An Easy Hot Tub Maintenance Schedule.